It's Daydream Monday! What is Daydream Monday? 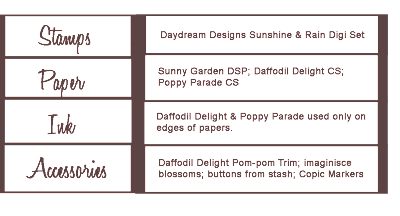 Well, it's the day I've officially declared for sharing projects made with digital stamps from Daydream Designs. 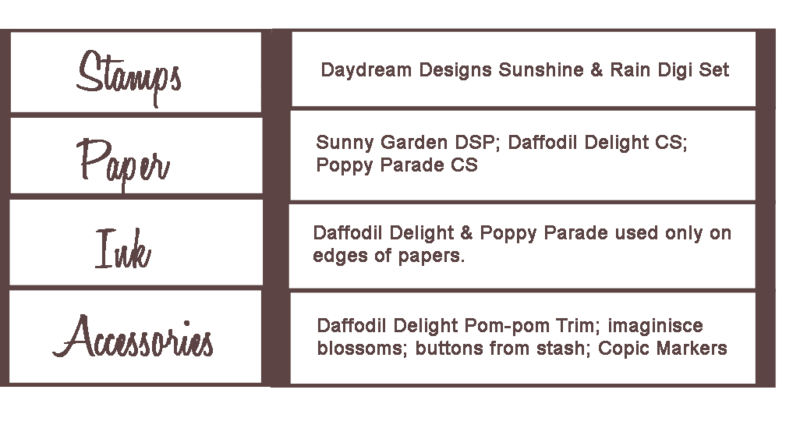 That doesn't mean that you might not see some Daydream Designs images pop up in some of my other crafty blog posts during the week, it just means you are guaranteed some Daydreamy goodness on Mondays. 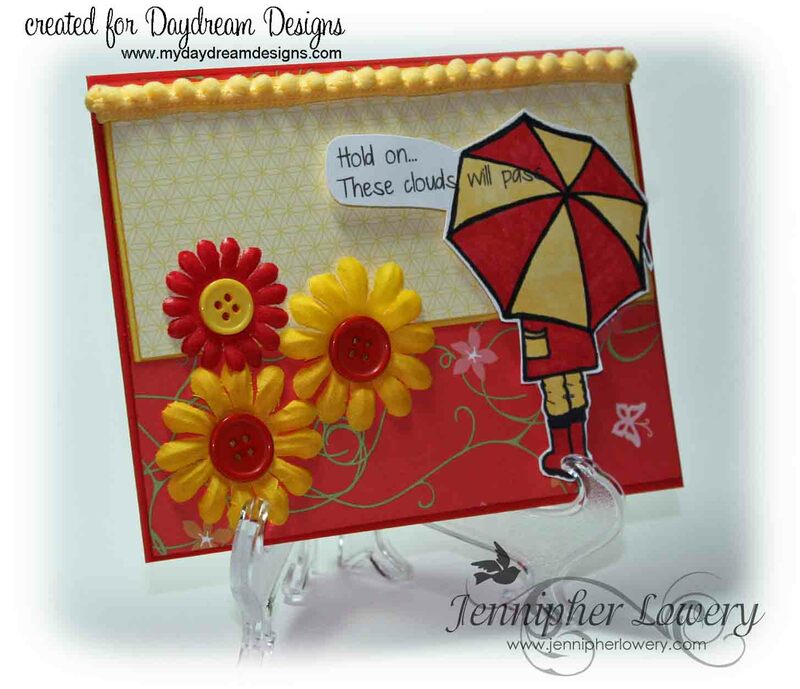 Today I am sharing a card created with the Sunshine and Rain digital stamp set. It's one of my favorites. This is beautiful, Jennipher!! I love that it's all yellow and red!! That is such a cute image, too! WOW..you are on a digi roll, girlfriend! Love this...you did great! Its perfect for our SSIC challenge too. Fabulous creativity! Very pretty! Love how you did the sentiment on the umbrella! You are getting so good! Love the flowers and buttons. This is just fabulous, Jennipher! I love the colours, so vibrant. Very cute! Oh my goodness, this is sooo sweet. I am loving it! Such bright fun and pretty colours. I need to play with this set soon! Thanks so much for joining us at Stampin' Sisters in Christ this week! Very cute, love the color combo! Thanks for sharing! Very cute and great job on the fussy cutting! What a happy card! Nice cutting, looks like a die cut! Very cute card Jennipher! Love the bright, fun colors & layout....excellent work as always! Fabulous job with the image layering and you're doing great with the coloring. What a fun card, Jennipher! Love the bright colors! Such a fabulous card. Fantastic design. I have worked for the Plastic Cards Printing and designing company and this design inspire me so much. Thanks for sharing. What a beautiful card! Love the red and yellow colors used on this card. Adorable, Jennipher! And such a great job cutting out the image! This is so cute Jennipher. This is such a cute card, complete with flowers and great colors. I especially love the way you did the sentiment! 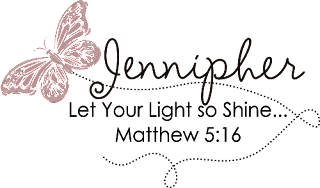 Jennipher: I think it turned out just adorable. I love this set, and you really made the red and yellow combo work together so beautifully. It's such an honor and blessing to be on the Dream Team with you, and I hope I can do half the job you are doing to represent Diane's darling images with my cards and projects. If you get the chance, I would LOVE LOVE LOVE to have you link up and play along at Word Art Wednesday (my challenge blog). We need your participation, and it would be such a blessing to have you fellowship with us and share your beautiful art. If you get the chance, please stop by and check us out!